THE BIG SHRIMPY NEST DOG BED. Big Shrimpy's Nest is built for comfort and security. Eco-friendly, too! Dogs love to curl up and snuggle into the plush sides. So cozy & secure. Durable.Classic style. The zippered, removable center cushion cover and bolstered sides of the Nest are made of Faux Suede (washable). The bottom of the bed has a tough nylon packcloth base. 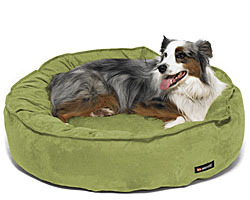 The zippered inner bolster and cushion are made of ripstop nylon that is both odor and water-resistant. The bed is stuffed with "SmartFill", Big Shrimpy's signature 100% recycled fiber (more substantial than other brands, easy to refluff). The Nest can also be flipped inside-out to extend its usable life. Note: Covers for the Nest only come in "Sets' due to color variations in dye lots of fabric.